The microsurgical anastomosis between the internal spermatic vein and the inferior epigastric vein was first described in the technique of testis autotransplantation. In this surgery, performed in children, the anastomosis is difficult because of the extremely tiny wall of the internal spermatic vein. Straffon and coworkers  have therefore maintained that venous drainage via the internal spermatic vein is not strictly necessary for the testis. Occlusion of the internal spermatic vein is commonly performed for varicocele correction, leaving the testis without its major venous pathway. 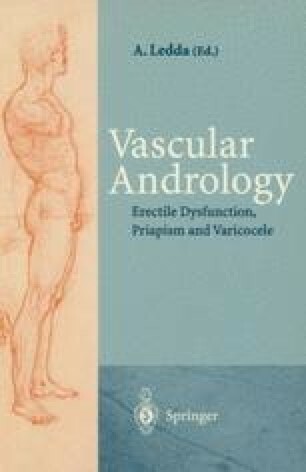 However, Silber’s reports [9, 10] and our experimental studies  have demonstrated that a certain damage to the autotrans-planted testis is always present when the venous anastomosis is not accomplished, and now there is general agreement that the venous drainage of the testis should be restored to normal in testis autotransplantation [4,10].